Our talented and devoted instructors aim to deepen your practice and meet you where you are to inspire your curiosity as well as your growth, healing and ultimate experience with your self in our classes. We are so grateful to the experience, wisdom and compassionate nature of each of our trained instructors. We have quite the range of modalities represented: Therapeutic, Vinyasa, Iyengar, Hatha, Integral, Ashtanga Yin, Kundalini, & Children’s Yoga; Specialty training for movement classes - Tai Chi Chih, Nia, and Qoya - as well as additional training and ongoing development that our dedicated instructors have invested in to share with our community! We are here to ensure a safe, comfortable and enjoyable experience for students of all levels & abilities. It is our goal to enhance the health and well-being of our community and to meet each student where they are with educated instruction. We focus on building healthy relationships and sustainable practices for our students. Jenne teaches yoga and meditation in traditional studios as well as in mental health settings for adults and at-risk youth. She works with individual clients and with groups using somatic (body-based), contemplative (meditation-based), and nature-assisted therapies to deepen intimacy and compassion with ourselves, our bodies, with each other, and with the natural world. Jenne often incorporates her soothing singing voice into her therapeutic work. Jenne is a qualified mental health professional, certified yoga therapist, and an Asheville native. She holds a Master’s in Transpersonal Psychology from Naropa University and specializes in somatic, mind-body approaches to improving mental health. As a member of the International Association of Yoga Therapists, Jenne has specialized training in therapeutic, trauma-sensitive yoga and meditation-based practices. Therapeutic Yoga engages biomechanical and neuropsychological expertise to create gentle and intelligent sequences that relieve tension, anxiety and fatigue while improving brain function, digestion, heart and respiratory health, joint mobility, muscular tone and flexibility, physical posture and balance, and overall physical and psychological resiliency. As an instructor, Jenne strives to empower students to progress toward improved health and well-being through safe, informed, and precise application of yoga practices that are suited for each individual’s capacity and health conditions. You can learn more about her at jennesluder.com. Bev walks his talk. Tai Chi Chih has developed his inner peace and he continues his practice daily. He is a retired organist and played in multiple Hendersonville churches for 20 years. Now in his eighties, Bev is strong, supple and bright in spirit; he owes it all to Tai Chi Chih. There are 19 moves in this form of Tai Chi. Learn more about Tai Chi Chih on our site! Sandi completed her 230-hr Yoga Teacher Training at the Asheville Yoga Center, a 100-hr Iyengar Yoga training with Cindy Dollar and holds certificates in Advanced Yoga, Nurturing the Teacher Within, Restorative Yoga, & Yoga for MS. Sandi combines a good sense of humor and encouragement with her love of being active that the belief that anyone can do yoga...all you need is to be able to breathe! Marian completed the Senior Yoga Teacher Training and Advanced Studies taught by Stephanie Keach at Asheville Yoga Center in 2011. She finds inspiration through Arlene Riley of Spiritus Yoga Studio in Hendersonville. She has also studied Yoga Fit and is a registered Yoga Alliance Yoga Teacher (RYT 200). She is currently on the cusp of completing 300 Hour RYT Advanced Studies Certification. Marian encourages her students to feel better physically and mentally while also helping them discover the joy of movement. Her yoga teachings highlight the importance of wellness by tapping into their higher power through spiritual meditation and deep breathing. Movement and breath are truly a gift. Marian has taught Viniyoga style of Hatha Yoga since 2011. She discovered yoga over 20 years ago in San Francisco after the birth of her first daughter. Yoga not only strengthened and aligned her back due to pain, but gave her newfound peace of mind. Yoga strengthens physically, mentally and spiritually and provides courage to do one's very best. Marian specializes in a gentle yoga composed of a love of movement, breathing techniques, and supported poses with postural corrections. Kathleen Sweeney began practicing yoga in 1973 and became a teacher in 1989. She is trained in both Integral Yoga and Vinyasa Krama Yoga and has combined these systems and what she has learned from famous senior teachers over the years. She is now semi retired and in her late 60’s so she is more inclined to teach the gentler classes; her passion being turning people onto all the wonderful aspects that create a total yoga practice. She claims any flexibility that she has can be attributed to yoga, which makes her a very compassionate teacher. “My mom was extremely flexible but it skipped a generation! Some people are just born that way.” No judgment. No expectations. Just allowing the body to transform with time and practice. Leading others to greater health through movement is my passion, my mission, my joy! Privileged to introduce Nia into the Asheville community in 1998, I have had the pleasure of teaching Nia, and mentoring other Nia teachers, ever since. Every class I teach is customized for the students present that day. Each one is a gift from the heart of Nia, through my heart, to you. In a Subtle Yoga informed teaching manner, Maria tailors her instruction for the individual’s needs by offering several choices for a pose to be the most accessible. A large component of her teaching style is being trauma informed to provide a safe environment to increase healing, self-awareness, and personal balance. Maria is a seventh generation Hendersonville native and a licensed mental health and substance use therapist. Her master’s degree is from the University of South Carolina in clinical social work. She has integrated yoga interventions with her adult therapy clients individually and in group sessions at her private practice, Resilient Journeys, PLLC for the past three years. She is a certified 200-hour yoga teacher registered with Yoga Alliance and is currently working toward her 500-hr. Maria’s training has specialized in Subtle Yoga, which focuses on inclusion for all fitness types including those who are disabled. Since safety is paramount, Maria’s guidance is at a mindful, thoughtful pace. Polly’s Yogic journey has been filled with hundreds of hours of individual and group instruction under master yoga teachers in Anusara, Restorative, Vinyasa, Ashtanga, and Yin. She also loves to teach Yin Yoga. “Yin helps you connect to this self-compassion, giving you permission to nurture your body, and allowing you to passively apply gentle pressures throughout your tissues, bones, and ligaments, allowing your energy to flow freely”. Polly continues to work on her yogic self-study and will be completing her 200 hour training at the Asheville Yoga Center this year. Polly is a certified Yin Yoga instructor, and a certified children’s yoga instructor. She retired from the Miami-Dade Public school system having taught for almost 33 years. She began seriously practicing yoga in 2013 after pursuing many other forms of exercise throughout the years. A neck problem, and other injuries inspired her to become more aware of why these injuries were happening and how she could move her body differently to help alleviate everyday aches and pains. She soon learned that yoga is not just a physical practice but an “inner” practice as well, constantly trying to bring the principals of compassion, and mindfulness into everyday life. She has attended: two week-long yoga retreats, led by a master RYT yoga teacher trainer and instructor, a two-day workshop with Yogi Cameron, and a Yoga Anatomy workshop with author and yoga instructor David Keil. In 2016 after having completed 60 hours of training under Karma Kids Yoga, LLC, Polly began her kids’ yoga journey. “I love doing yoga with children, it helps them understand how their bodies work while exercising both their body and mind. Jagdeesh began her journey through the practice of yoga in the 90's. Certified as Massage Therapist in 2000 she also decided to become a Hatha Instructor with Stephanie Keach. In 2002 she began to search for more in her practice and that is when Kundalini Yoga as taught by Yogi Bhajan became a heart centered practice for her. She also has been sharing the healing sounds of the Gong since 2015. Daya Narayan began practicing yoga in the 1990’s when the aches and pains from running had caught up with her. As she approached retirement from a career in nursing and management, she never dreamed of becoming a certified yoga teacher until she experienced the power of Kundalini yoga as a physical and spiritual practice. She became a certified Kundalini Yoga Teacher in July, 2016, at the age of 70. Along with her yoga practice and healthcare background, Betsy brings a lifetime of service and spiritual study to guide people in finding balance, joy, and openness in the everyday experience of their physical and spiritual selves. Read more about Kundalini Yoga on our site! Marina is a teacher, world traveler, mompreneur, free spirit. Having lived in three cultures for longer periods, she truly believes in one human family instead of borders or races. She helps women transform, make changes in their lives for the better, discovering that their wisdom is within. For Marina, discovering Qoya was truly Love at first sight. She knew it was her life’s calling from her first class. It helped her remember on a cellular level that dancing is in her DNA. Every woman should have the permission to move the way it feels good. This experience is incredibly liberating for all ages, shapes or personality types. She is passionate about taking Qoya to all the women she encounters around the world. Originally from Hungary, Marina is also the owner of Compassionate Compass, a service designed to provide life direction to her clients. Since discovering Qoya in November 2017, Marina has taken all the steps to become a certified teacher, went to teach it overseas in Hungary and Austria. She attended a Qoya teacher gathering for European teachers in Ireland, and is committed to offering it to women in this community, in Hendersonville. Currently teaching fitness classes at the YMCA Hendersonville. Those classes include; Hydroburn and Fluid Movement aquatic classes; Yogalates; Low Impact Fitness (Chair aerobics), QiGong at YMCA Hendersonville, NC. I substitute various other classes including Yoga, Zumba, Spinning, Tai Chi, Barre, and Spinalates. ﻿Christie is certified with Yoga Alliance through the 200hr Teacher Training Program at Asheville Yoga Center (RYT200) and she is currently enrolled in their 300hr Advanced Studies Curriculum. Yoga is a way of life for Christie and she carries it with her on and off the mat. It has been through her own transformative process in yoga, that she became a firm believer in the power of bringing body, mind and spirit together. As a teacher, she brings this transformative message to each class where she helps students learn how to connect with their bodies and gives them tools that they can use to cultivate a more centered, serene and balanced life. Her classes are heart felt, encouraging and informative. In these extensive multi-year trainings she developed her passion for neuroscience, psychoneuroimmunology, anatomy and physiology and her skill as a conscious embodiment coach. After years of teaching to the patients and staff in hospital and hospice settings, her focus of enhancing somatic awareness and consciousness embodiment has shifted to working with individuals taking up the leadership of their lives. 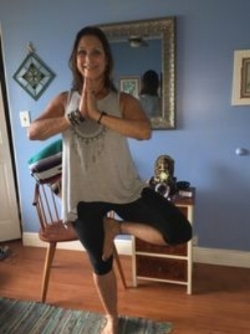 As part of recovering from years of bookkeeping (and only teaching yoga as a hobby) Jean Marie entered the world of mind-body medicine earning her RYT 500 as a Kripalu yoga teacher. From the Integral Yoga Institute (Satchidananda Ashram) she received a cardiac yoga teacher certification and within that training she learned Laughter Yoga (1997). As her version of post graduate work, she received certification from The Academy for Guided Imagery and The Muscular Therapy Institute. As a process called Engaging Your Wholeness, she teaches Yoga Nidra, Laughter Yoga and her specialized pelvic floor somatic yoga series for women transitioning into peri-menopause and menopause. She hosts a monthly program called Feed Your Juicy that includes a monthly themed yoga nidra recording and a free Q & A tele-seminar on the New and Full Moon. Aoife (Eefa) Clancy is from Ireland originally and has lived in the States for 27 years. She has been practicing Yoga for over 16 years and started teaching when she moved to Etowah NC in 2015. Her background as a professional musician quickly lead her to recognized the healing benefits of sound when joined with Yoga. Using Traditional Gaelic melodies, vibrational sound and spoken word, Healing Sounds Yoga helps to induce a deep sense of peace and well-being while reducing the stress of daily living. Aoife practices a Hatha style Yoga which is suitable for beginners and also for students who have been practicing Yoga. Aoife is also a Certified Reflexologist from the New England Institute of Reflexology in Onset MA and has been practicing since 2001. Ownership of the studio means fostering an environment of joy, passion and rebirth for myself and others. I am filled with excitement in this promising venture and look forward to meeting each of you! As I enter into this journey, I feel my own devotion and experience in healthy aging and relationship-building is paramount to The Shift community's vision. I have devoted many years to serving the aging population, with specific interest and education for those living with dementia, those who wish to age in place, and their families. As a certified children’s yoga teacher, A Matter of Balance: Concerns About Fear of Falling Master Trainer, Dementia Friendly Business leader, and Caregiver Advisory board member, I intend to continue bridging the gap of multi-generational needs and experiences through movement, restructuring, creativity and connection. I also believe we can facilitate community expression through dialogue about wellness, spirit, and growth in daily living. With trust, truth, intention, and grace we move through the process effortlessly. Follow your bliss! Emily Miller, Founder of The Shift, has a strong passion for the human body, and the power that it holds as a translator of the divine. In a way, she sees her role as a guardian; a protector of the beautiful temples that walk around on this planet. Her goal is to help you gaze inward and gently guide you to use your body (in the state that it is) with grace and confidence. Her work includes one on one somatic therapy, unique yoga flows, and a program she has developed called B.O.D.Y. Mapping (Branches of the Divine You), which uses spectacular music and specific movements to open, charge, and discharge all 7 chakras of the body. Her background came up through the world of rehabilitation and personal training, teaching in parallel. Emily is considered a master teacher, with over 10,000 classes under her belt, and a no-student-left behind mentality. 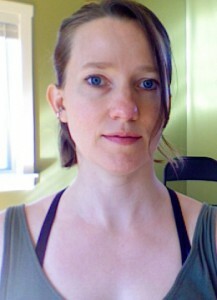 Emily opened The Shift studio in July of 2015.